MYOB Accounting system comes under the category of small business accounting systems. Many medium sized companies also use this system because of its powerful features, ease of use and affordable pricing. View the features of MYOB Accounting software with screenshots to help you understand the software better. MYOB Accounting is NOT JUST an easy-to-use accounting software. It has powerful business tools that will save you time, make you more organised, and help you get paid faster. It has a simple interface behind which is a powerful double-entry accounting system. MYOB Accounting software simplifies bookkeeping procedures and produces all the financial reports for you automatically. It has modules for Sales (AR), Purchasing (AP), Banking (CashBook), Inventory (Stock Control) and Accounts (Gen Ledger). As a business owner, you can use MYOB software to manage all aspects of your business. You may, or may not, be the one who is entering the data into MYOB, but you surely will be able to generate the reports, and check the health of your business with a few clicks. MYOB has arranged its menu screen (called 'command centres') at the top of the screen for Accounts, Banking, Sales, Puchases, Inventory and CardFile. These icons represents activities or transactions that most businesses conduct on a regular basis in the running of their business. The window that opens up will look like your familiar looking paper forms that you use to manually wrte your payment voucher, or take your customer order. MYOB Accounting is an operations-based accounting software. Use MYOB Accounting software to record daily operations such as invoicing, purchasing, receiving goods, goods delivery, collecting deposits and payments from customers, making payment to suppliers and making payment of recurring expenditure. After you complete the on-screen windows for a transaction (eg enter a payment to your supplier), and click the 'Record' button, MYOB Accounting will immediately create the accounting journal entries, and post it to the relevant journals. The transaction journals are saved and can be viewed and printed for audit purposes. Behind the simple MYOB interface is a powerful double-entry accounting system, which will be done for you automatically. It's as good as hiring a book-keeper. MYOB software uses plain English on its interface, and is designed for business owners who does not have formal accounting training. Accounting jargons are avoided at all costs. Words like 'Spend Money', 'Receive Money', 'Enter Sales', 'Print Purchase Order' are used in to describe the tasks to be completed. MYOB's powerful, yet easy to use features will help you reduce the time spend on doing paperwork relating to all aspects of your business, and it will compile, collate and analyse the data into meaningful information which will help you better manage your business. After you record the transactions in MYOB, you can print the relevant document such as payment vouchers, sales invoices, delivery order, purchase orders, official receipts, statements, address labels and much more. These documents can be further customised by inserting your own logo, and rearranging fields and columns according to your own liking. MYOB Accounting is also an important business tool to help you track your project costs and budgets. 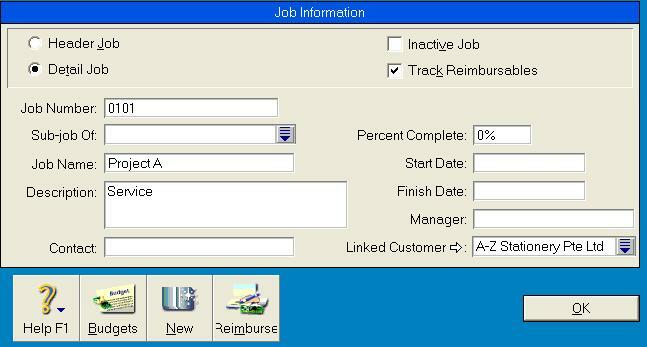 You can also create Job codes to keep accurate and detailed records of projects income and costs. Jobs can be linked to specific customers, and be used to track reimbursable expenses. You can enter budget for jobs, and you will be able to analyse the profitablilty of each job against the budget.